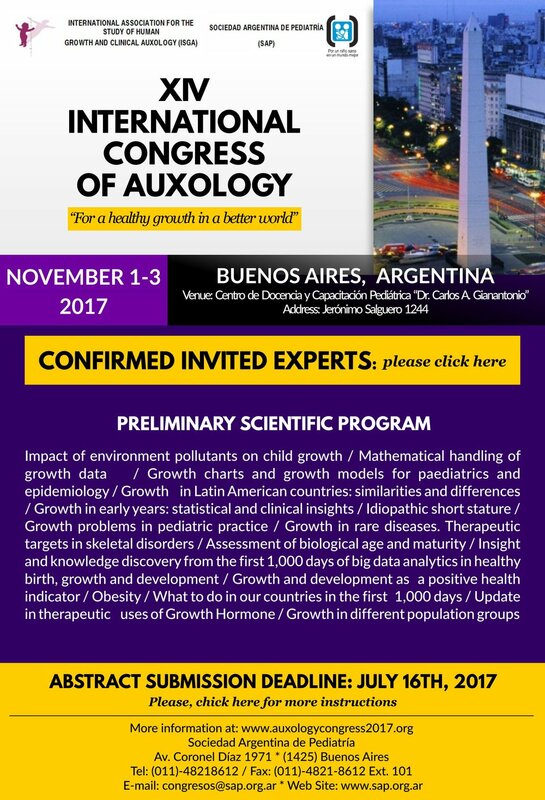 Yet another meeting of the International Association for the study of Human Auxology (ISGA) will be celebrated, this time in Buenos Aires, Argentina, on November 1 – 3, 2017 in a joint effort with the Argentine Society of Pediatrics (SAP). SAP is a centenary scientific society founded in 1911, which integrates more than 17,000 pediatricians from all over Argentina. ISGA, a scientific society devoted to the study of human growth was founded in 1976 and 3 yearly an International Congress have been held since then. The central subjects of study have varied over the decades: from the initial interest in the descriptive aspects of human growth (both in individuals and in population groups), passing through the research on the biology, genetics and endocrinology of growth and growth promoting agents, the mathematical handling of growth data, growth assessment and the construction and use of growth standards and references, the monitoring of growth as a mirror of society, up to the more recent research on perinatal growth, late biological and health consequences of early nutritional and auxological experiences and the epigenetics of growth. Researchers from many fields participate on the study of these subjects: pediatricians, anthropologists, endocrinologists, mathematicians, developmental biologists, physiologists, public health doctors, physical educationalists, teachers, economists and historians. We intend that this meeting in Buenos Aires will join all these experts working in an interdisciplinary way on the field of growth, an area “ where Physiology, Psychology and Sociology meet”, according to James M. Tanner’s words. We expect to achieve these goals with the participation of attendants form all over the world, met in friendly atmosphere, in a friendly city. We look forward to seeing you in Buenos Aires in November 2017 !